Atsuta Shrine (熱田神宮) is Jingu Shrine located Nagoya, Aichi. It was built in 113 A.C.E. and enshrines Atsuta no Okami and the sword of Kusanagi. The sword of Kusanagi, place at Atsuta Shrine, is one of three sacred imperial treasure of Japan. In Japanese myth, after Yamatotakeru no Mikoto conquered eastern Japan, he visited Owari and married the Owari governor's daughter. He left the sword to his wife and traveled Ise. When he died at Ise, she took his sword to Atsuta and built Atsuta Shrine. Because of the sword of Kusanagi, Atsuta Shrine is one of the most important shrine in Japan besides the grand shrine of Ise. In 1560, Oda Nobunaga visited and prayed his victory for the battle of Okehazama. Atsuta Shrine, familiarly know as Atsuta Sama or Miya, has been one of the greatest centers of worship in Japan from ancient times. Visitors to the shrine, including those who practice the conventional New Year Worship, now count nine million annually. The enshrined deity Atsuta-no-Okami is Amaterasu-Omikami as represented by the sacred sword of Kusanagi, one of the three sacred imperial treasures that symbolize the imperial throne. The tradition says that this great god, by the divine decree of the god of creation Amatsu-mioya-noMikoto, manifested for the first time the way of gods to this world and blessed mankind with the virtue of love. Also enshrined are the "Five Great Gods of Atsuta," all of whom are mythologically connected with the sacred sword. Among them, are Takeianadane-no-Mikoto and Miyasuhime-no-Mikoto, first parents of Owari-Uji, indigenous people of Nagoya and its neighboring districts. These two gods are said to have shown many divine virtues in accordance with teaching of Amaterasu-Omikami. Atsuta Shrine was originally founded about 1900 years ago, when the sacred sword of Kusanagi was enshrined. Atsuta was chosen as the site for the shrine by Miyasuhime-no-Mikoto, the daughter of Owari-no-Kuni-nomiyatsuko and wife of the then Prince Yamatotakeru-no-Mikoto, who had died leaving the sword in Hikami. 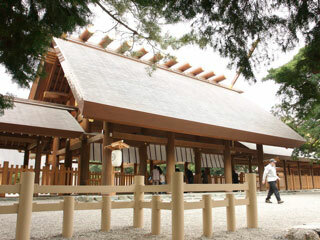 Ever since Atsuta Shrine has been specially revered by people, ranking second only to the Great Shrine of Ise. The shrine has not only enjoyed special privileges of the high official ranks of Myojintaisha and Chokusaisha, but it has also won popularity among people, who call the shrine by the familiar name of Miya. Moreover, the geographical character of the fertile Owari Plain has fostered a faith in Atsuta Shrine as protector of agriculture. This can be testified by the fact that many of the festivals and divine services show close connection with popular life centering around agricultural industry. Here lies the characteristic feature of this shrine. The shrine buildings were maintained by the effort of devout generals of successiv times, such as the Shoguns of Muromachi and Edo, Nobunaga, Hideyoshi and Tokugawa, ruling family of Owari district. In 1893, the shrine was remodeled into Shinmei-zukuri structure, the same style of building as the Grand Shrine of Ise. On the occasion of Sengu celebration in 1935 the shrine buildings as well as othe facilities were completely rearranged and improved so that i it came to assume the grandeur true to the Grand Shrine of Atsuta. During the WW II, however, more of its buildings were destroyed by fire. After the war, the reconstruction was begun by the combined effort of all devout worshippers of the shrine all over the country. THe main buildings were completed in 1955 to enable Hondensenzai to be celebrated here. The remaining construction was steadily under way to perfect the shrine as a great spiritual center equipped with modern facilities for cultural activities as well. ... was built by Oda Nobunaga after the battle of Okehazama happened in 1560. ... was built by 5th Tokugawa Shogun Tsunayoshi.